October is National Breast Cancer Awareness Month. 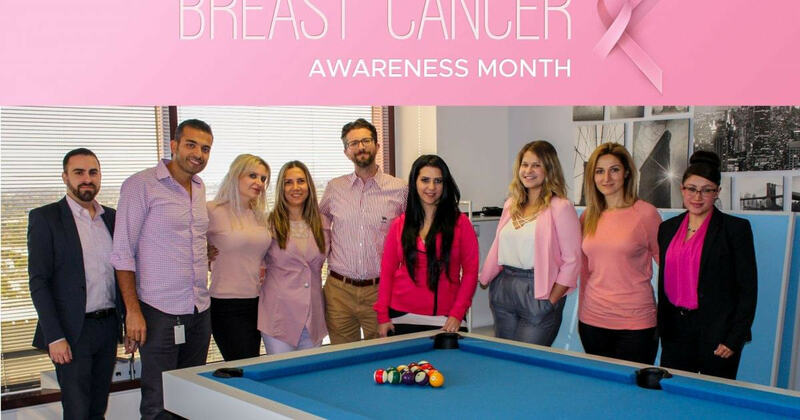 Today, our employees wore pink to increase awareness for this significant cause and Phonexa made a donation to the National Breast Cancer Foundation (NBCF). -1 in 8 women will develop breast cancer in their lifetime. -Second to skin cancer, breast cancer is the most commonly diagnosed cancer among women. -African American women under 45 are particularly at risk for developing breast cancer. -Though deaths have steadily declined since 1989, about 40,920 women are expected to die of breast cancer in 2018. -85% of breast cancer diagnoses occur in women with no family history of breast cancer. -Creating awareness is critical so women (and men) of all ages are aware of the high risks of breast cancer. This is why we decided to wear pink today—to remind people in our office and in our lives that breast cancer is a threat we must stay vigilant against. The average mammogram costs roughly $150. This cost can be a barrier to the uninsured or women who are sole earners for their families. The NBCF helps make this vital examination accessible to all women by providing free mammograms as part of its mission. The NBCF also provides a free guide for early detection, available here, along with step-by-step videos on how to look for symptoms and how women can examine themselves. We were thrilled to be able to contribute to breast cancer awareness today and we encourage others to get involved as well! * The previously mentioned facts are provided by www.Breastcancer.org and is one of many sources available for this topic. No claims, promises or guarantees to the accuracy or completeness of the information is made by this website.